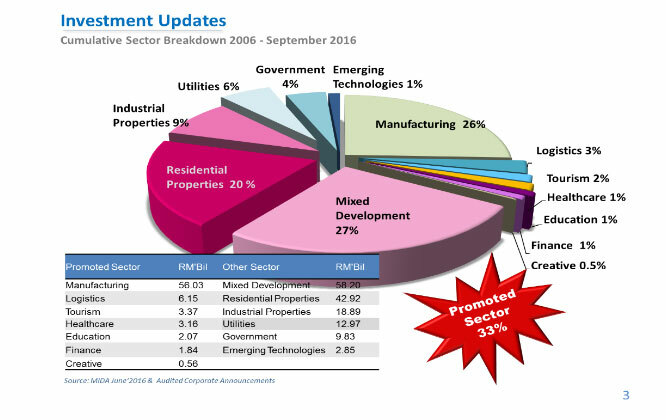 ISKANDAR MALAYSIA, MONDAY, 31st OCTOBER 2016: The third quarter of 2016 saw Iskandar Malaysia securing RM10,85 billion in new investments, bringing the total cumulative committed investment secured to RM218.84 billion from 2006 until 30 September 2016. Of the total cumulative committed investments, RM113.36 billion or 52% represents investments that have been realized as projects on the ground. Datuk Ismail Ibrahim, Chief Executive of Iskandar Regional Development Authority (IRDA) said from January 2016 until 30 September 2016, Iskandar Malaysia has made tremendous ground in getting new investments and we are not far from our annual target of RM25 billion for this year. “Iskandar Malaysia continues to do well despite the challenges facing the global economy on the back of this economic region’s resilience and strength in its nine promoted sectors namely Electrical and Electronics; Petrochemical and Oil & Gas; Food & Agro Processing; Logistics; Tourism; Healthcare; Education; Creative; and Business Services. “Domestic investments makes up RM132.13 billion or 60% of the total cumulative committed investments to date. This shows the confidence in Iskandar Malaysia especially among local investors as we continue to develop the region into a strong and sustainable metropolis of international standing,” said Datuk Ismail. Datuk Ismail added these investments in turn, create plenty business opportunities for local entrepreneurs and SMEs as well as job opportunities. This simply means that the investments continue to benefit the Rakyat of Johor and Malaysia. Since 2007, a total of 682,169 jobs have been created in Iskandar Malaysia, both in the nine promoted economic sectors, as well as other sectors such as property, construction and retail of which 15% of these are skilled jobs. Johor has also enjoyed an increase in average household monthly income – from RM4,658 in 2012 to RM6,207 in 2014. Iskandar Malaysia is well on track to realizing its long-term goals and Datuk Ismail remains optimistic that the region will continue to attract a stable inflow of investments now that landscape of Iskandar Malaysia is taking shape at a tremendous rate. Iskandar Malaysia will reach ten years in November 2016. This economic development region is proud to boast of many notable achievements. Moving forward, Iskandar Malaysia aims to achieve balanced growth where urban development contributes towards improved and quality built environments while taking every effort to optimize usage of resources, and protect and conserve nature which are important for the sustenance of the region. “Starting 2016, Iskandar Malaysia embarked on its third development phase which is to Sustain and Innovate. This phase will be focusing and gearing towards being inclusive and sustainable, providing a multitude of prospects for growth and prosperity to be enjoyed by all stakeholders in Iskandar Malaysia specifically and the rest of the nation, in general. The key for Iskandar Malaysia now is to ensure consistent growth in its economy, social and environment. “Iskandar Malaysia annually targets cumulative committed investments of between RM25 billion and RM30 billion. Moving forward, our focus will be to ensure green and social agendas including talent development and SMEs continue to contribute towards the growth of this region.” Said Datuk Ismail. 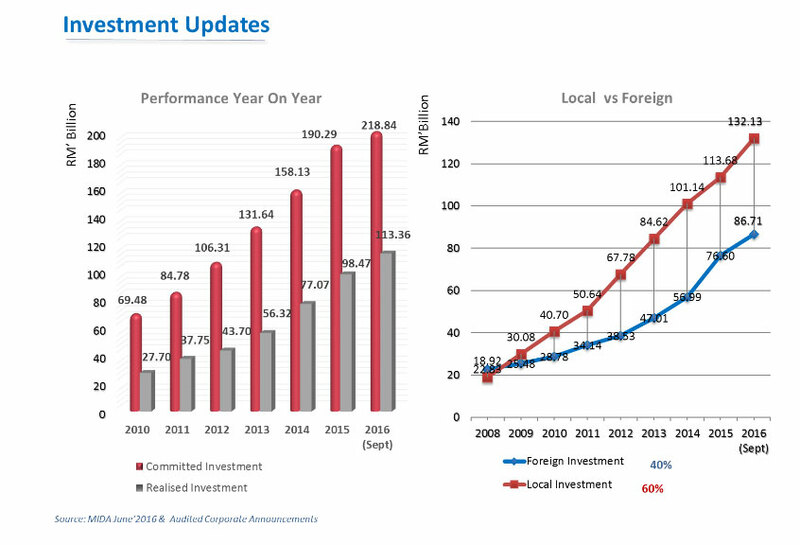 Of the total cumulative committed investments, 40% (RM86.71 billion) came from foreign investors. Top five countries with highest investments intoIskandar Malaysia from January to September 2016 are from China, Singapore, USA, Japan and Spain. “We would also like to thank the Federal Government which has allocated RM2.1 billion for infrastructure and socio-economic development in the economic corridors including Iskandar Malaysia in the 2017 Budget announcement recently. “Iskandar Malaysia has achieved many milestones and these achievements are the result of the strong co-operation and support from the Federal and State governments, private sector and the Rakyat. With that, I hope, we can continue to work together in realizing Iskandar Malaysia’s vision as A Strong and Sustainable Metropolis of International Standing,’ said Datuk Ismail. 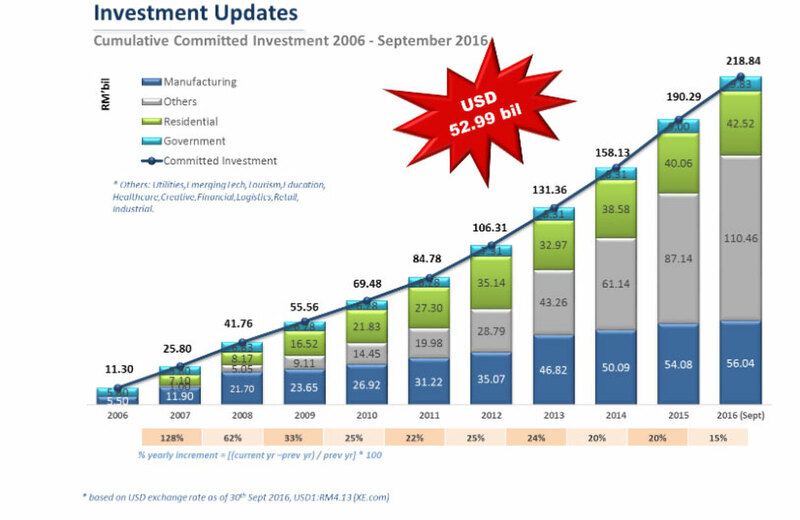 Note: Graphic of investment statistics are appended below for your reference. The Iskandar Regional Development Authority (IRDA) is the regulatory authority mandated to plan, promote and facilitate the development of Iskandar Malaysia into a strong and sustainable metropolis of international standing, where living, working, business and leisure converge seamlessly. Iskandar Malaysia is an economic development corridor booming in Southern Johor, Malaysia. The development region encompasses an area of 2,217 square kilometres which is three times the size of Singapore and two times the size of Hongkong. Iskandar Malaysia is envisaged to capitalize on its current synergies with Singapore as it aims to complement each other as an economic hub. Meticulously planned under the Iskandar Malaysia Comprehensive Development plan (CDP), the economic region comprises of five flagship zones. Flanked by three major ports, the Pasir Gudang Port, Port of Tanjung Pelepas and Tanjung Langsat Port.